Alan generously allowed this piece, written for the GVN site, to be published here. In looking at the world with its widely varying values systems, it is interesting to see how the word ‘democracy’ means different things to different people. An example of this is, when leaders from the Western developed world speak of Democracy, they generally mean constitutional democracy based on a universal franchise, multi-party system. These countries generally operate in the BLUE/ORANGE/GREEN/YELLOW spectrum of values systems. However, in developing economies constitutional arrangements can vary with the values spread being across the PURPLE/RED/BLUE/ORANGE/GREEN range. In cases such as this, ‘democracy’ means something different to the first example quoted as PURPLE/RED/BLUE requires a modification of the type of system that is likely to be effective. In this case a firmer more directive system is likely to work best. Note: We also wish to acknowledge with thanks the input from Don Beck on the above graphic ‘Stratified Democracy: Managing the Global Mesh’ (2002) on which this article is based. The PURPLE system covers tribal societies where there is a mutual reciprocity and kinship. This is an elegant system which on its own can be very appropriate and successful. An example of this is the tribal system still found in certain remote parts of the world which only now are being influenced by technology. It is however, still also found in the witchdoctors muti (medicine) still influencing many people in African countries as well as in other similar underdeveloped regions. It is important to note that this value system normally exists with other systems such as RED and BLUE and not in isolation. The RED system includes many countries where, following independence in the 60’s, there was a regression to one party states with dictators and their elites being in control. Examples include the Congo, Zimbabwe today and a variety of countries in other parts of the world. In many of these countries following the deterioration in the political climate and with the resulting deterioration in security, education and health services many of the people with the necessary skills but with opposing values systems (BLUE/ORANGE) left these countries, thus making the practical situation on the ground even worse. The BLUE system can be a friendly such as the authoritarian democracy as experienced in Singapore and latterly in China. This is the type of values system which does not encourage too much autonomy in the provinces and is based on a unitary system of government. Equally, the BLUE system can be punitive and does not encourage dissent or criticism. This can result in a system which makes things work but at the same time does not encourage public debate on major issues. Strong BLUE starts to soften as it acquires tinges of the ORANGE ‘free market’ approach. The ORANGE system allows for a multi-party system such as that found in the United States of America and the United Kingdom. This allows for significant devolution of power to the states/regions on a federal basis while at the same time providing overall benefits for citizens on key issues such as taxation, health insurance and other issues. It also results in maximising the use of assets. The GREEN System includes countries such as the Scandinavian countries and the Netherlands. This system encourages GREEN issues such as the environment and quality of life over other issues. At this stage Social Democracies tend to be concentrated in the European Union rather than North America even though states like Minnesota in the US have many of these values present in their society. People are seen as being able to benefit equally from the resources available within a unitary system. There is a need in developing countries for a YELLOW Integral system which will allow aspects from all of the 1st Tier systems from PURPLE/RED/BLUE/ORANGE through to GREEN. The 2nd Tier YELLOW system is like the Formula 1 racing car with many gears, each suitable for differing life conditions including the integration of 1st Tier values. There are varying levels of developing economies from smaller economies like some of those in Eastern Europe to India with its large population and with a wide range of values systems. At the same time India has a large middle class who are both literate and technologically capable. Here, as in Africa, values also range from PURPLEe through to GREEN but with the percentages in each system being different. However, one of the key issues of developing economies is that in many cases they require a different style and type of Democracy from that practiced in the Post-Modern world. Another example is in the Middle East where Israel (BLUE/ORANGE/GREEN) lives right next door to the Palestinian areas which are less developed and fall into the RED/BLUE/ORANGE range. These conflicting values systems are part of the current problem with actions and reactions often being based on these conflicting values and realities with punitive RED/BLUE being the dominant values. In the Post-Modern world the values systems range is smaller, normally from BLUE through to YELLOW. However, even in these countries there is often evidence of the re-emergence of RED systems, particularly since 11 September 2001. This has been evident in a number of elections held in Europe recently, including France and the Netherlands, where there has been a regression to BLUE values in terms of reducing immigration, controlling crime and other similar issues. ‘Fortress Europe’ is still a very real reality in terms of protecting existing values. The question of countries like Afghanistan and the type of political system required is particularly interesting. This is a country which has a large percentage of PURPLE/RED values with people who come from a largely rural tribal background as well as there being a number of powerful warlords in the national mix. At the same time there is a need for the country to build a sound infrastructure based on the required BLUE/ORANGE economic values. This requires a new type of constitutional dispensation which allows for the management of all these values simultaneously. This has just been highlighted by the initial demand for the ex-King to be the Head of State (ELLOW structures are also required to bridge the gap and to add the ORANGE/GREEN developed structures and systems. A major problem with the existing approach of most of the Post-Modern countries is that there is generally little understanding of the PURPLE/RED values range or how to manage these. This is one of the reasons that many of the rulers with RED power value tendencies in underdeveloped nations have managed to avoid the appropriate response from the developed world required to unacceptable actions which they may have instituted. The key to these levels of ever increasing global complexity is in the understanding and implementation of YELLOW Integral systems in business, politics and other spheres of life. If the world is to prosper as a whole into the 21st Century, more integral managers are going to be required in all spheres of life, both in the private and public sectors. It is unlikely that these skills will be developed through traditional leadership programs, either within existing university business schools or other similar institutions. It is therefore suggested that the recently formed Institute for Values & Culture in the United States could possibly fill this role in conjunction and with other global players such as the Global Values Network. It is often said that the new South African Constitution is one of the most advanced in the world from a pure values perspective. However, if South Africa and the NEPAD (New Program for African Development) is to move forward, a 2nd Tier YELLOW approach is required in order to integrate the necessary points of difference into a shared vision. In terms of an Integral Approach the YELLOW model can be shared and used globally where leaders share the will to overcome the problems facing them by using the best aspects from the various values systems while at the same time integrating competing demands. As an integral part of the strategy it is important to take the values technology and through a number of key pilot projects provide the understanding of how to use the technology in practice. The technology is an elegant ‘open system’ and the use of this approach provides leaders with the YELLOW Integral capabilities necessary to assist in moving the global development process forward. Following the above phase, a further key requirement to a better understanding of values is for the technology to be communicated and made more widely available to global leaders and other opinion formers. As we have seen from the above, democracy is not a one-size- fits-all solution to the problems of the world. Based on this insight the question needs to be asked how this knowledge can be communicated and transferred to global leaders as well as other global institutions including the World Bank, IMF, WTO and other similar development agencies. There is a general realisation that neither the ORANGE or GREEN approaches work in isolation and the next step must surely be to use the YELLOW 2nd Tier Integral approach in moving forward. Equally, in the first phase of 2nd Tier, the approach must be in building YELLOW Integral structures in order to more fully understand the process of building these 2nd Tier structures and approaches. Current QuickSCAN* returns show that the existing pre-dominant values system in the world is ORANGE at 31.7%. The BLUE value represents the most people with 30.2%, followed by ORANGE at 24.8%. It is important to note that GREEN and YELLOW values systems currently represent 5% or less of the global population mix and are therefore minority values at this stage. We need therefore, to continue to encourage the trend towards Integral YELLOW as the next major step required for positive change at the global level. It is also important to bear in mind that the current YELLOW leadership core is around 1.5% of the total world population and is unlikely to rise above this significantly in the short to medium term. 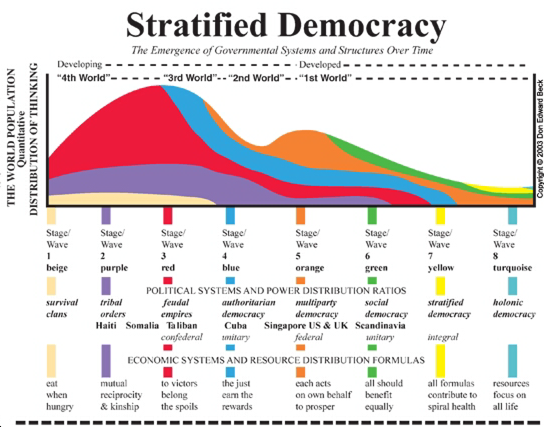 What is clear is that current global democratic systems need to move through the stages from authoritarian democracy (Singapore – BLUE), on to multi-party (US/UK – ORANGE), social democracy (European Union – GREEN) and then on to Integral Democracy (YELLOW – still emerging and developing). Although the percentage of individuals possessing YELLOW Integral values is currently very low it is possible to obtain significant change on a number of global issues. This however, will require the global leadership group from both the private and public sector to provide integral frameworks upon which national and regional policy direction can be developed and built. It is suggested that one of the key ways of spreading the technology is through a global values survey using the WorldSCAN** instrument as a starting point. This will provide the foundation for a better understanding of global values systems and how these influence competitiveness and the different styles of democracy currently used around the world. *QuickSCAN and **WorldSCAN are online values data collection tools at the Global Values Network site.